Well the choice was easy really. The nearest power is 200 metres away across other people’s property. So, with a voltage drop of 3%, I would need a minimum cable size of 120mm2! And at a cost of $40 a metre for single core, that’s about $16,000! So, with this in mind I have lashed out and purchased an Off Grid Solar system. For $6700 I have a standalone system that if need be can be expanded. I have customised the system to better suit my needs. I have purchased an extra four 300w solar panels (giving me a total of 1800 watts), upgraded the IPS to a 48 volt 4kW version with a built in 60Amp MPPT charger (giving me up to 3000W of solar input when I want/need to add more) and added the KW hour meter and Generator Input socket. At this stage I will just use the batteries in series, this will give me a 48 volt 125Ah battery bank. This will be the first thing that will get upgraded in the future and I'm thinking that I will get a higher capacity 48 volt battery bank rather than just add more of the same type of battery. 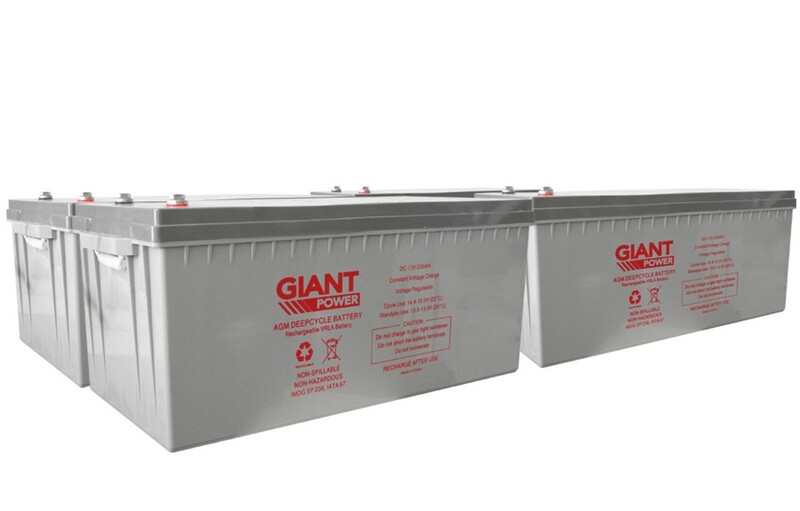 The batteries to the right are 4 x 12 volt, 280AH and will cost somewhere around $2700. 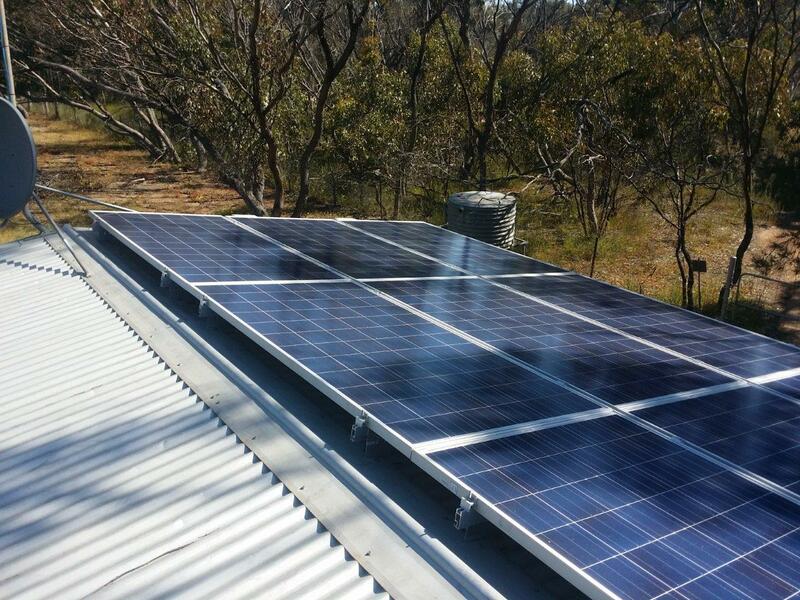 Information on the solar panels can be found here. Information on the Intergrated Power System can be found here. And below is the information on the IPS that I have. 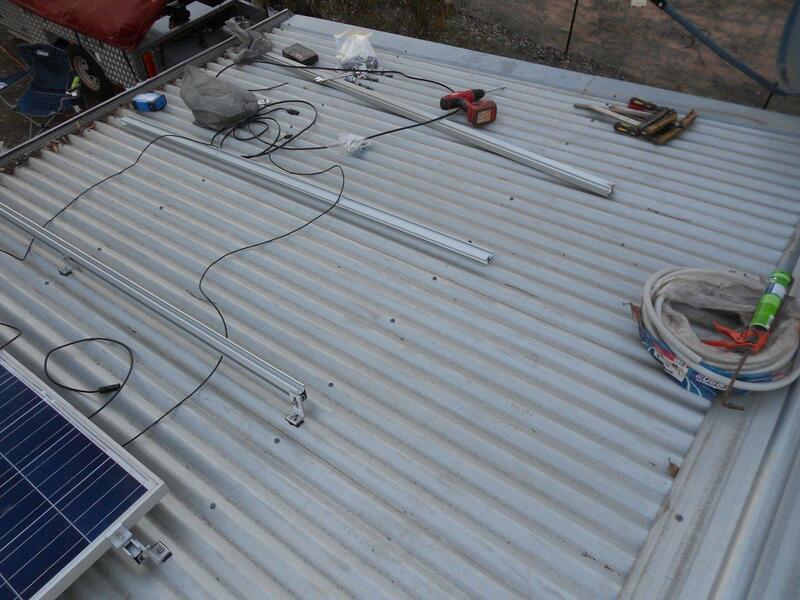 Connect your solar cabling or solar panels directly into your IPS, then sit back and relax while it controls the solar voltage and ensures it is converted to a safe level for your batteries. MPPT technology provides up to 30% more power than PWM controllers through superior efficiency. Don't restrict yourself to low voltage appliances - convert your DC power from batteries and solar to 240V AC, and run your mains power appliances. Pure Sine Wave ensures that sensitive electronics can be safely run without risk of damage. Not getting enough solar to keep your batteries full? Not a problem with the built in multi-stage AC battery charger. Connect to an alternate power source and the smart charger will top up your batteries and keep them happily on float. Ensure your system is always ready for whatever you can throw at it. Simply connect a compatible generator, set up when you want it to engage, and leave the rest up to the IPS. If your batteries are getting too low or your inverter is being overloaded, your generator will automatically kick in to supply the extra juice, and switch off again when it's no longer needed. 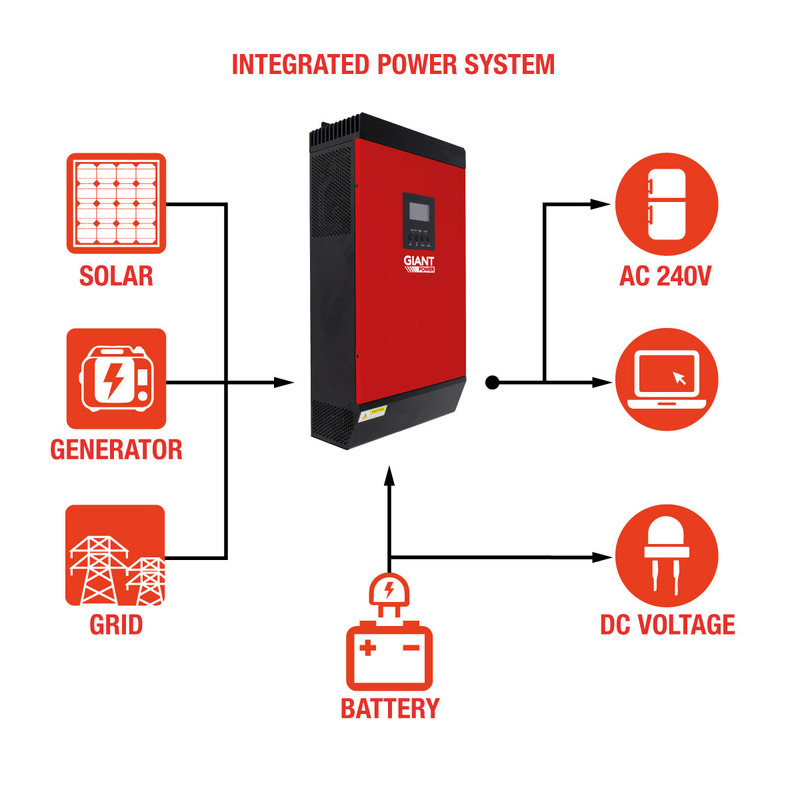 For additional versatility, your system can be wired to use 240V mains AC as an alternative power supply. 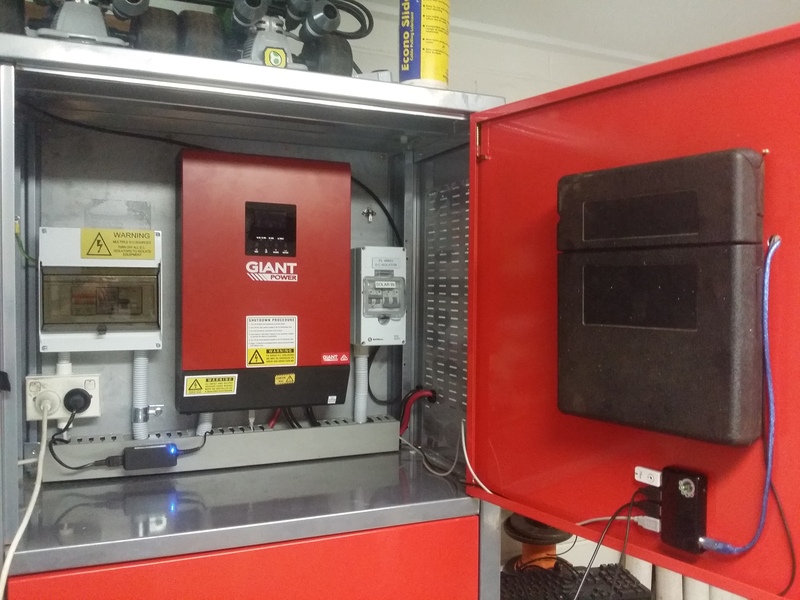 Ideal for portable applications where you might not always have access to mains, you can even set the system to automatically prioritise a certain power source. 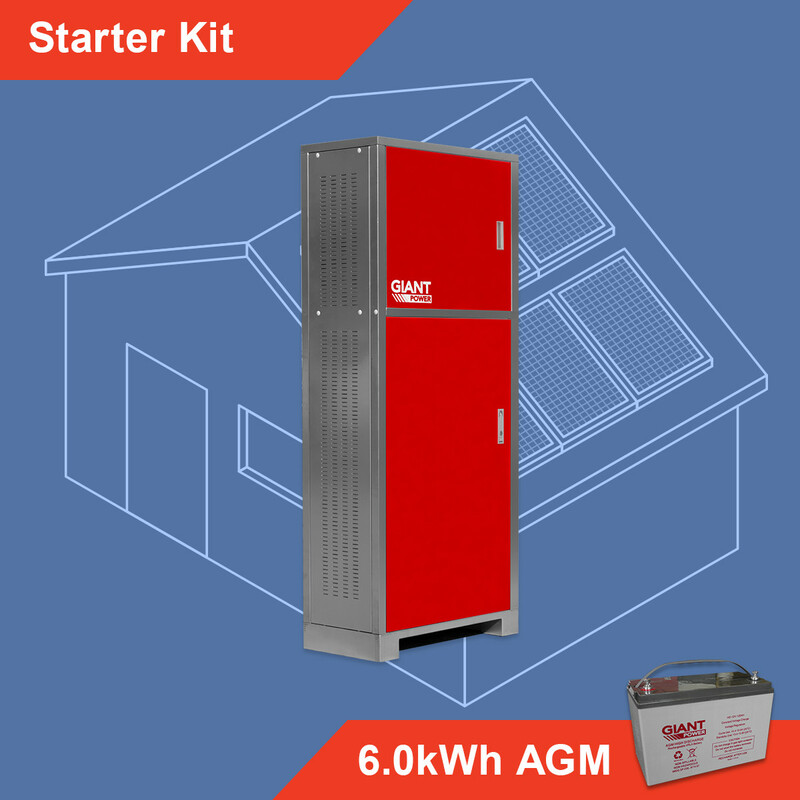 If you require a larger system than a single unit can handle, up to 6 units can be connected together using our parallel kit. This allows the units to communicate and work together as a single system. Keep track of how your system is running at a glance, with key data such as battery level, how much your solar is producing, and overall system status. Customise the display to show your preferred system measurements using the navigation buttons. Want a closer look at how your system is performing? 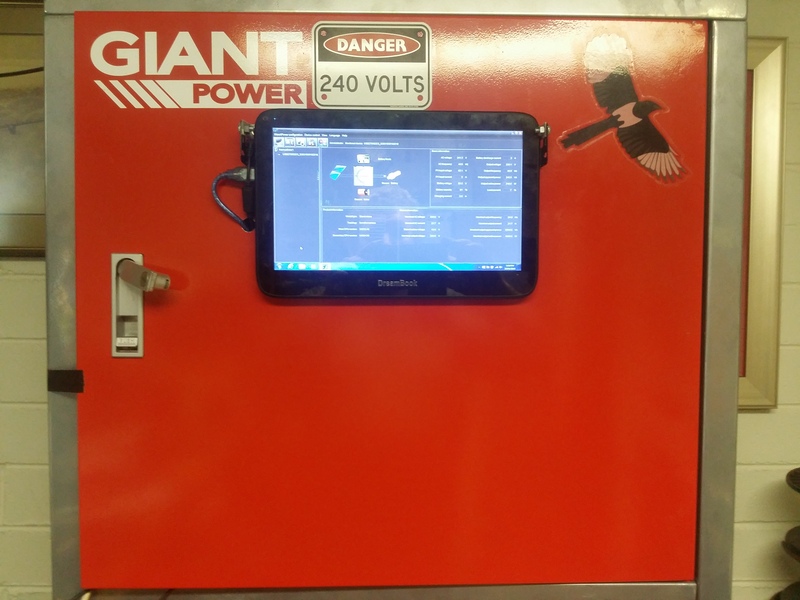 With the included monitoring software installed onto a laptop or computer, all you need to do is connect via USB for a detailed view of specifications, data, and system configuration. Almost every aspect of the system is configurable, from power source priorities to automatic system alert messages. Compatible with Windows and Linux. 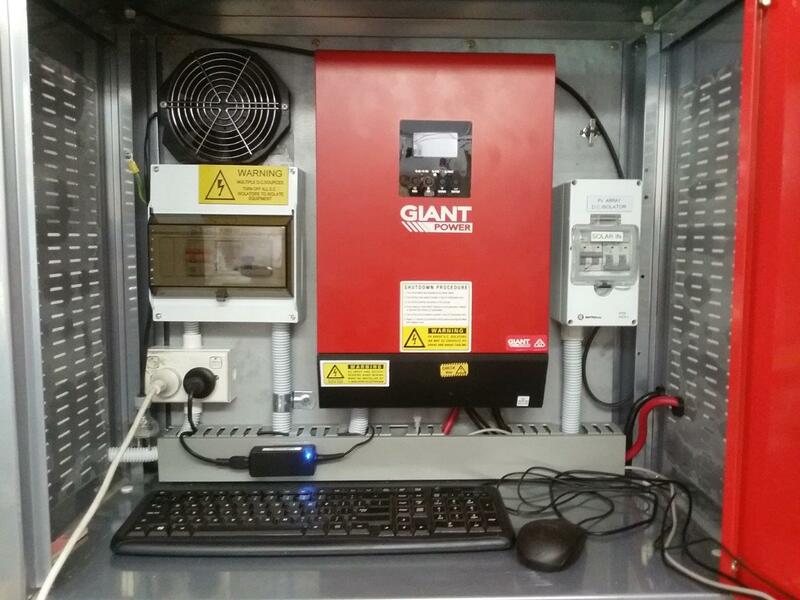 Giant Power Integrated Power Systems are approved as off grid inverters by the Clean Energy Council (the peak body representing Australia's clean energy sector), and are suitable for installation under the Renewable Energy Certificate scheme. Our home grown Australian support staff are ready to assist if you ever find yourself having problems. We provide technical help and troubleshooting via phone and email, so you can rest assured that you'll be in safe hands. 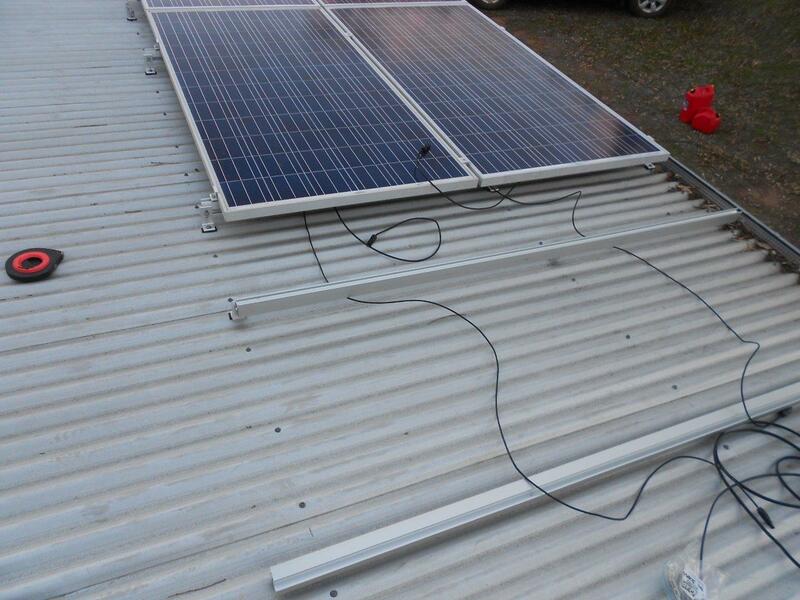 So this is the front of the off grid system. I have mounted my old tablet PC computer running Windows 7 and the monitoring software on it. I will be adding a folding tray for a keyboard and mouse as the touch screen doesn't work thanks to Lachlan (my son) who dropped it while trying to make it work! I did a fresh OS install to give it a fresh start and remove all the old crap that I had on it from over the years. With it's built in wifi i'm hoping that it will work with some soon to be released monitoring software so that the system can be monitored from the web. 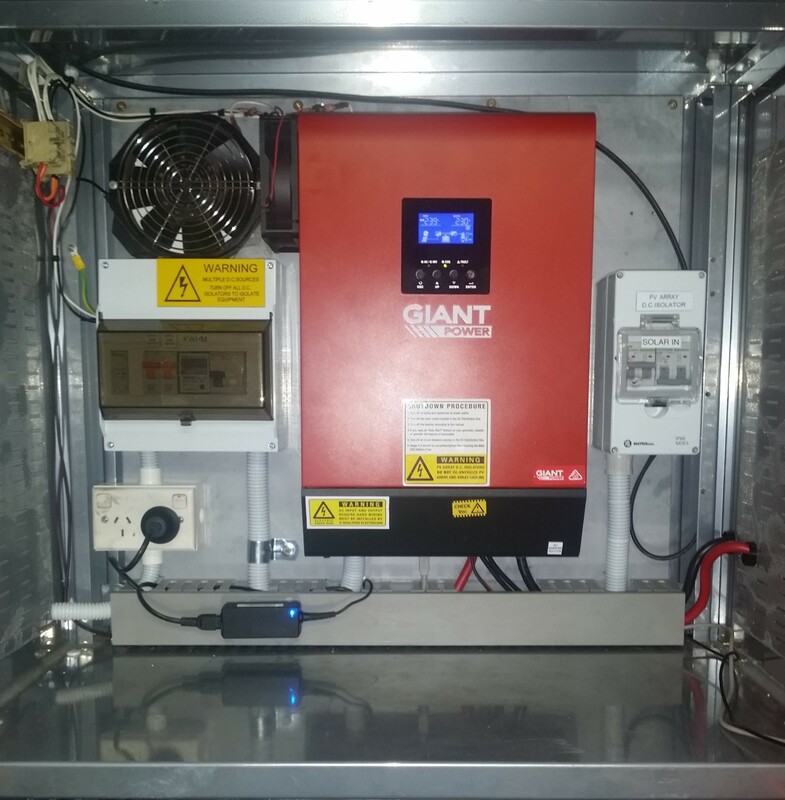 Inside the main section is the IPS (red box, see above for details) which does everything, solar controller, battery charger, 240 volt inverter and grid/generator controller. On the right of the IPS is the solar circuit breakers (two x 32 Amp DC circuit breakers) for the two strings of solar panels. On the left hand side of the IPS is the 240 volt distribution board. Grid/Generator circuit breaker, Inverter output circuit breaker, a watt hour meter to measure the power used and lastly a 16 Amp RCD for the power point that is mounted under the switchboard. Under the power point is the power supply/charger for the tablet PC. On the back of the door is a document holder for the manuals for the system and under that is the USB hub for the IPS, mouse, keyboard and a 16 Gb thumb drive for extra storage if required. So I've mounted a 240 Volt AC cooling fan to the top of the enclosure for when the system gets above 50 degrees centigrade. This switched via a 48 Volt contactor in the switchboard. I'm also looking at mounting an external fan on the side of the inverter to assist the internal fans. I may use an external fan speed controller that I made a few years ago so that the fan will alter it's speed with a rise in temperature, and it cool will shut down if not required. 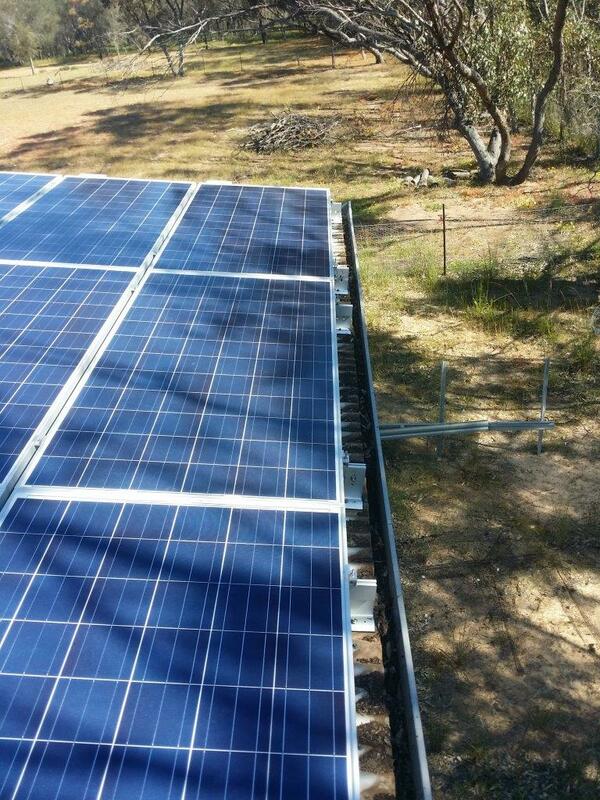 So this is the current view of the off grid system. I'm currently looking for a battery voltage monitor that I can view via the tablet which I can memote login to. I have installed 6 panels on the eastern side of the shed to get the system started. 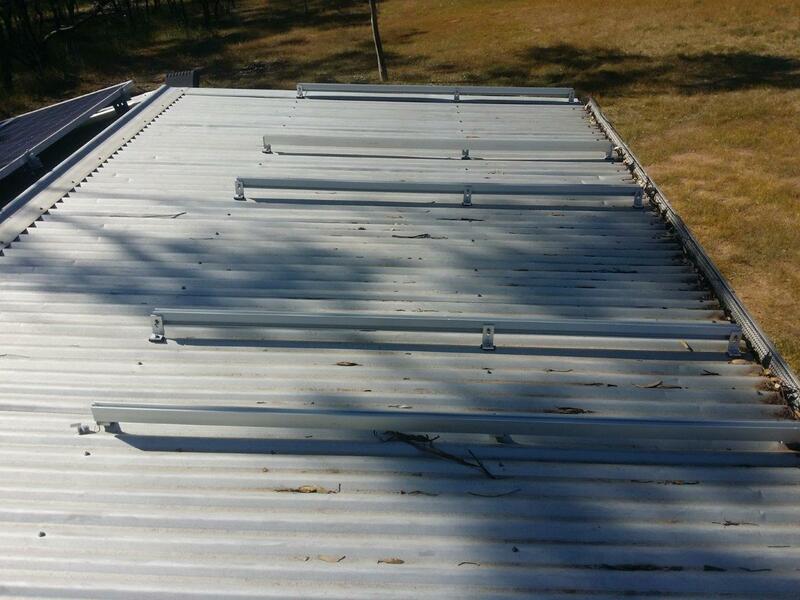 I used the ezy rail system that came with the kit from Aussie Batteries and solar. 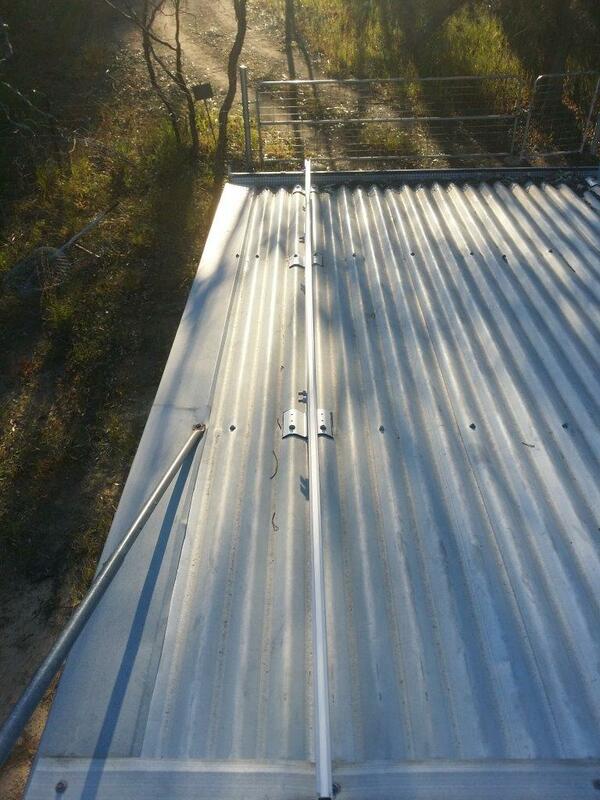 The rail system is better suited to a flat roof sheets and not corrugated iron. Also the end clamps that was supplied were for 35mm panels not the 40mm panels that came with the kit. Besides all the issuses with the parts in the mounting kit I managed to get the system on the roof and connected to the IPS inside. I installed the panels with about 150mm overhanging the edge of the shed so that I have enough roof at the othe end of the shed to walk and work. This is not to standard! However, I will rectify this later when I get more panels and a new mounting system and install it on the western side of the shed. 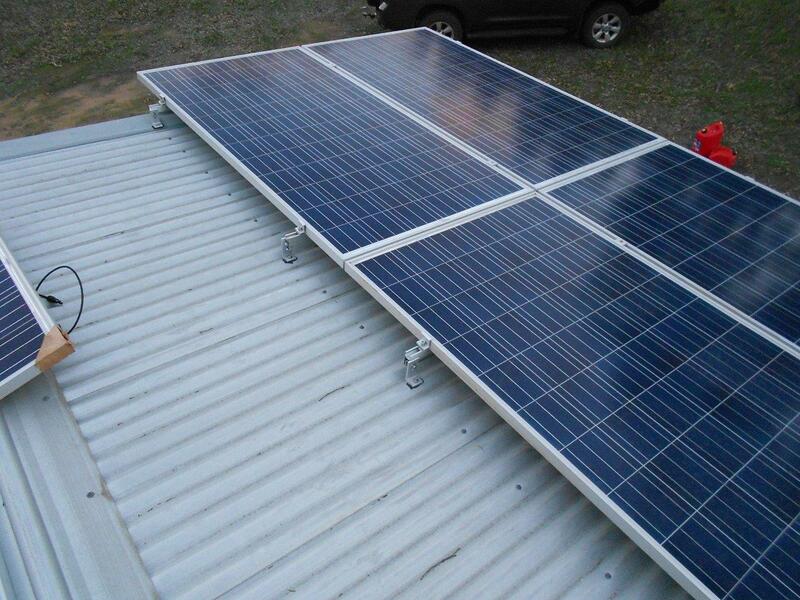 So, I have purchased another three 300 watt Suntech Solar Panels and a new mounting system from Alzone solar. 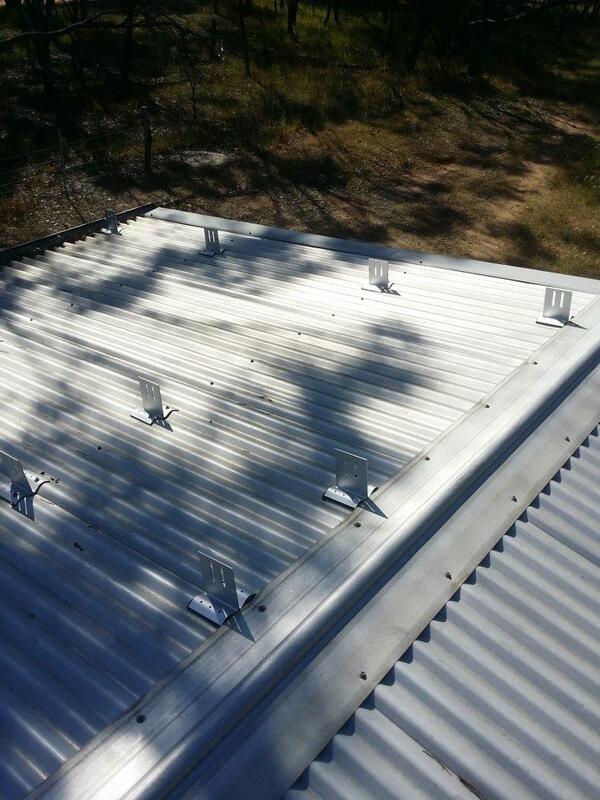 The mounting feet are designed to fit corrugated iron as you can see in the photos. 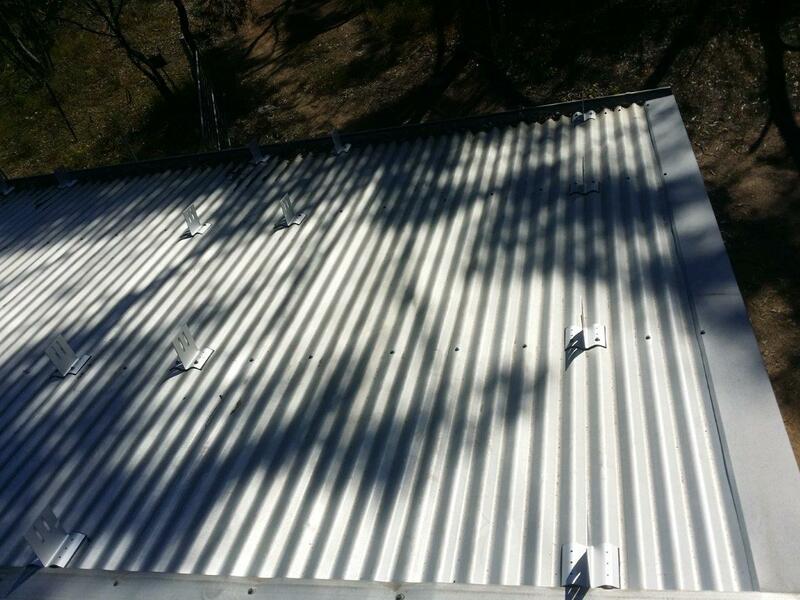 The mounting feet along the top of the roof required me to make a slit in the ridge cap so that they could slide under it alowing the fixing screws to drill into the steel frame under the tin. I used roofing silicone to seal up the slits to keep water out once I finished screwing in all the screws. This time I made sure that the distances from the edge were within the requirements of the standards. The frist mounting rail fitted. 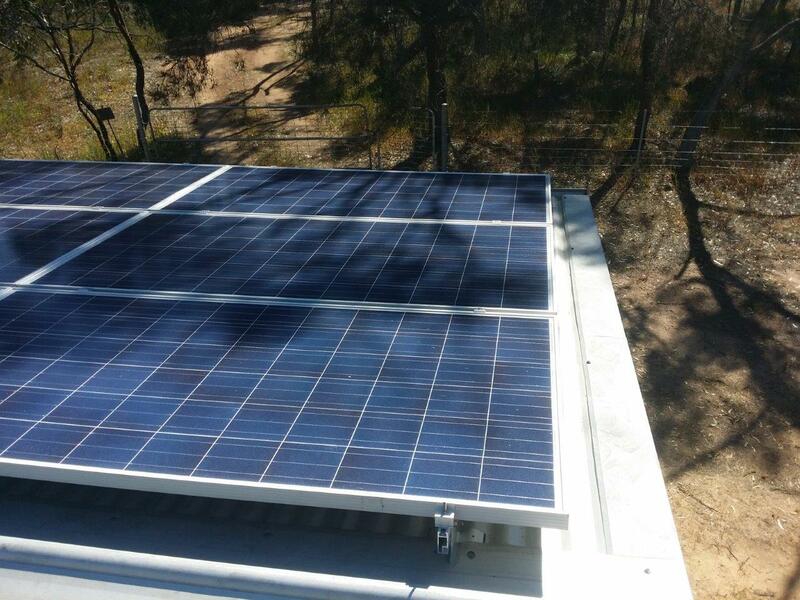 Nine 300 watt suntech aolar panels wired in three strings of three panels. The strings are wired so the each row are conected together. Top, middle and bottom row. 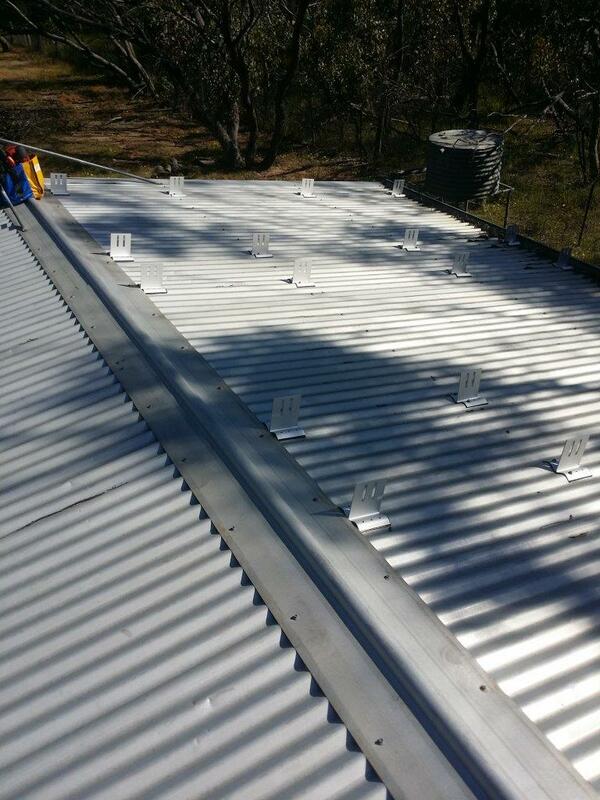 There is 250mm gap between the edge of the panels and the edge of the roof. Just enough room to walk down if you are careful! There is only just enough room to fit the system on the shed, but it does fit! 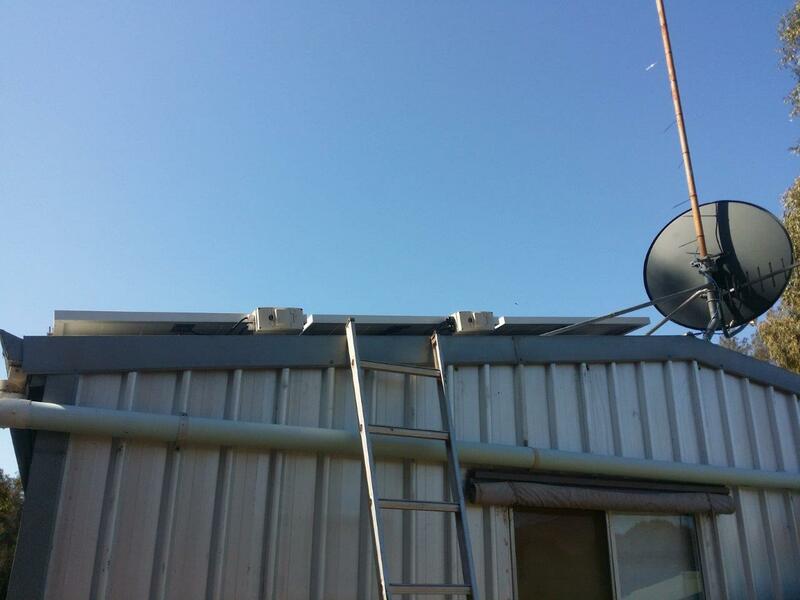 120mm to the edge of the tin plus the 75mm of gutter. Each row (string) has a separate isolator and are then wired together with a single twin 4mm cable to the IPS solar input circuit breaker. This will be changed on the next trip to the block, as I will add another 4mm twin cable from the bottom string to the second solar input circuit breaker in the IPS cabnet. This is not really required but I'm doing it to help lower the overall current in the cable to eliminate overheating problems, volt drop over current in the cable etc. So, this is the system so far as at 12th of October 2016.